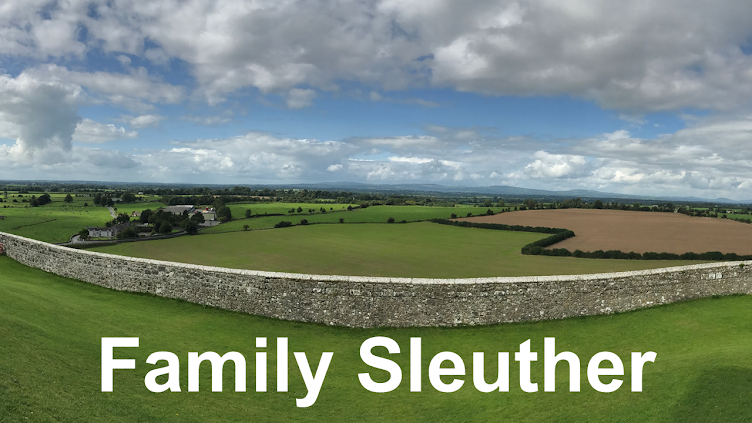 Who was the father of Thomas Kirk (1778-1846), my fifth great-grandfather? Finding an answer has been a difficult, arduous journey. A burned county courthouse, destroyed census enumerations, and lost family lore have obscured the truth. The Kirks were presumably of British Isles extract. Irish and Scottish naming customs directed that the eldest son be named after the father's father. Could it be that simple? Figure out the name of Thomas' eldest son and assume I have my sixth great-grandfather's name? Something tells me that Elizabeth Shown Mills is going to want a little more evidence explained, but let's have a look-see. We can get a sense for how traditional Thomas was by reviewing his wife's genealogy. Thomas was married to Sarah (Bonar) Kirk. Her parents were William and Jane (McCulloch) Bonar. The customary naming patterns directed that the second son be named after the mother's father and that the eldest daughter be named after the mother's mother. The Kirks appear to have adhered to naming customs. 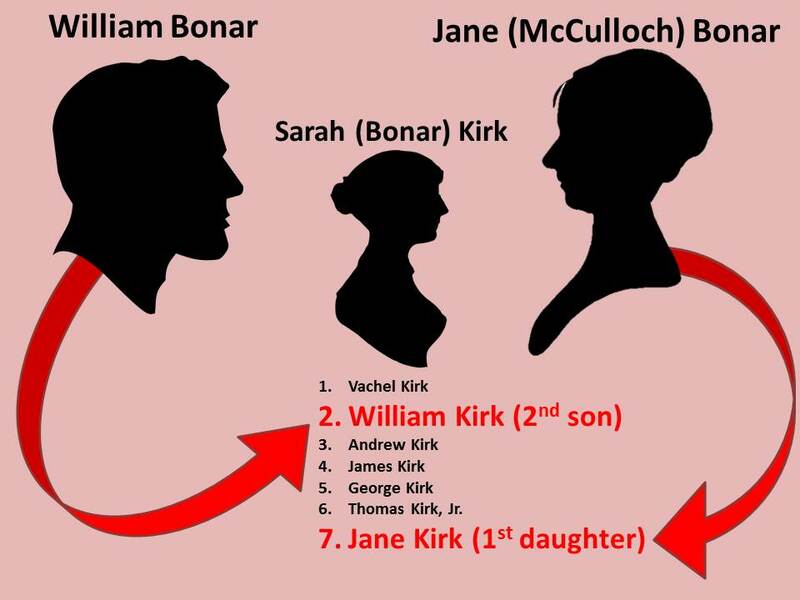 The Kirks' second son was named William and their first daughter was named Jane. Bingo! We have a match aligned with the naming traditions. But was it just a coincidence? 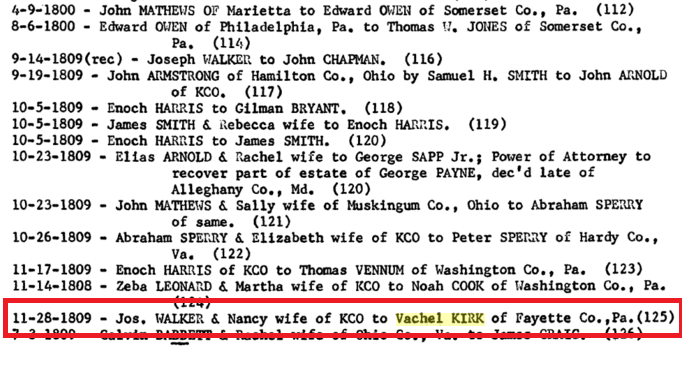 Kirk family genealogies agree that Thomas' eldest son was Vachel Kirk born in 1805. Great! Should I be looking for a Vachel Kirk? It is an unusual name that doesn't often appear in records. Perhaps Vachel is a family name? A November 1809 land record shows a Vachel Kirk from Fayette County, Pennsylvania purchasing land in Knox County, Ohio. Curiously, Knox County borders Licking County along the length of its southern border. Thomas and Sarah (Bonar) Kirk lived in Licking County in 1809 and for the duration of their adult lives. The appearance of this unique name and purchase of land near to my Kirks makes this Vachel a person of interest. He was in Butler County, Ohio by the time of the 1820 census. Two of his children, who were alive for the 1880 census, said their father was born in Pennsylvania. He died in April 1836. His headstone indicated that he was born in June 1783. This birth year confirms that the Butler County Vachel Kirk was not the father to my Thomas Kirk who was born in 1778. Instead, they were contemporaries only fives year apart in age. Perhaps they were brothers or cousins. Were they family? DNA Tests held the answer. I found a living direct male descendant of Vachel Kirk (1783-1836) willing to take a Y-DNA test. His results came back and were a very close match to the handful of direct male descendants of my Thomas Kirk (1778-1846), confirming that there was a shared common male ancestor between the two lines. Vachel and Thomas were indeed family. Unfortunately, the Y-DNA test couldn't determine the exact relationship. We need to examine autosomal results to see if common DNA still exists after generations of recombination. This research initiative is still ongoing. However, now that we've established that this Vachel Kirk was related to my Thomas Kirk, let's get back to his Pennsylvania roots. Is that where my Kirk family originated, too? 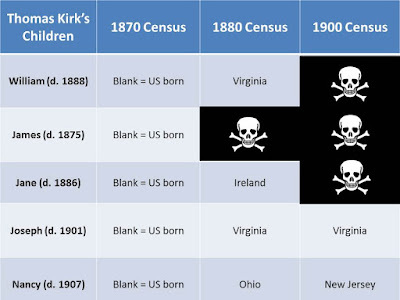 Thomas died before census records provided birth location information. However, five of his children lived long enough to provide this information when the 1870, 1880 and 1900 censuses asked for parents' birth location. The general consensus was that Thomas was born in America and likely Virginia with only a few outliers (Come on, Nancy! Was it Ohio or New Jersey? One of these is not like the other!). Daughter Jane listed Ireland in the 1880 census (contradicting her US-born response in 1870). Her Ireland response may hint at her father's ancestral origins and not necessarily his actual birth location. As Barry McCain, a Scots-Irish researcher, wrote, "Scots-Irish in Colonial America...often described their ethnicity as simply Irish." 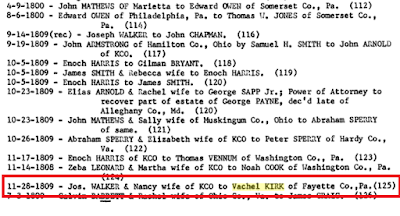 Mindful that they're related, how do I reconcile their birth locations: Thomas in Virginia and Vachel in Pennsylvania? 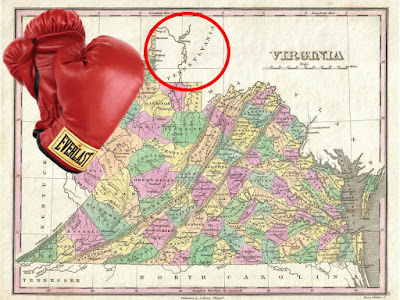 In the 1700s, both Virginia and Pennsylvania claimed the area that would become Fayette County (where Vachel lived in 1809 when he bought land in Ohio and 1810 when he was enumerated on the census). 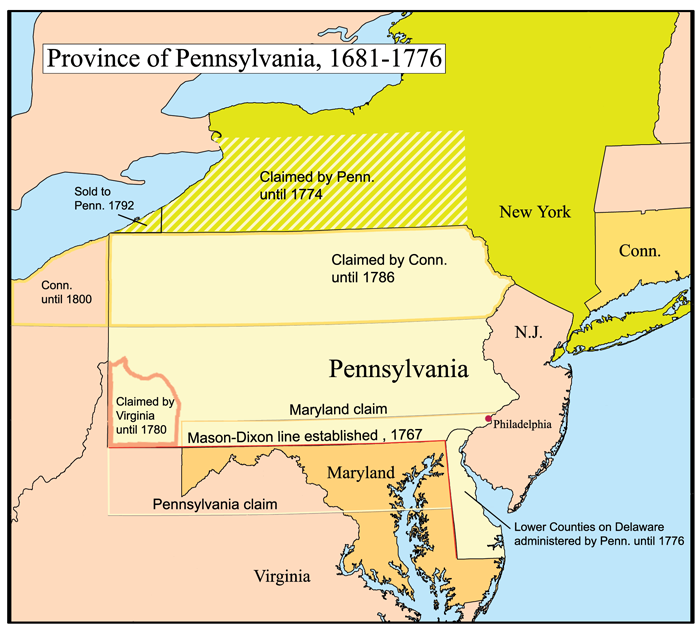 Virginia and Pennsylvania were locked in a land dispute pre-1780. The competing territorial claims resulted in duplicate legal and civil systems existing side-by-side. Citizens' loyalties - either to Pennsylvania or Virginia - afforded them the choice to determine under which state's jurisdiction they lived. The confusion came to an end in 1780 when agreement was reached on addressing the border conflict. If the Kirk family was from the Fayette County area, this would mean that Thomas Kirk, born in 1778, could claim that he was born in Virginia. However, after the 1780 border resolution, Vachel's birth in 1783 would leave him born in Pennsylvania. As a result, it's possible that both men were born and raised in the same location while the borders and state jurisdictions changed around them. Who are the Kirks I should be looking for in the Fayette County, Pennsylvania area? What if I review the names of both men's children and their grandchildren to determine the most frequently reoccurring names? Could I infer that they are traditional family names handed down from one generation to the next? I could then scan Fayette County for Kirks with these same given names, and start with those individuals for closer inspection. Thomas and Sarah (Bonar) Kirk had thirteen children (in alpha order): Andrew, George, Greenberry, Hugh, James, Jane, Joseph, Nancy, Rachel, Sarah, Thomas, Vachel, and William. Of these children, nine had children of their own. A quick glance at his nearly 60 grandchildren reveals that the most commonly occurring names for Thomas Kirk's grandsons were James (occurring 6 times), Thomas (occurring 4 times), and Joseph (3 times) followed by Elijah/Elisha and John (each used twice). 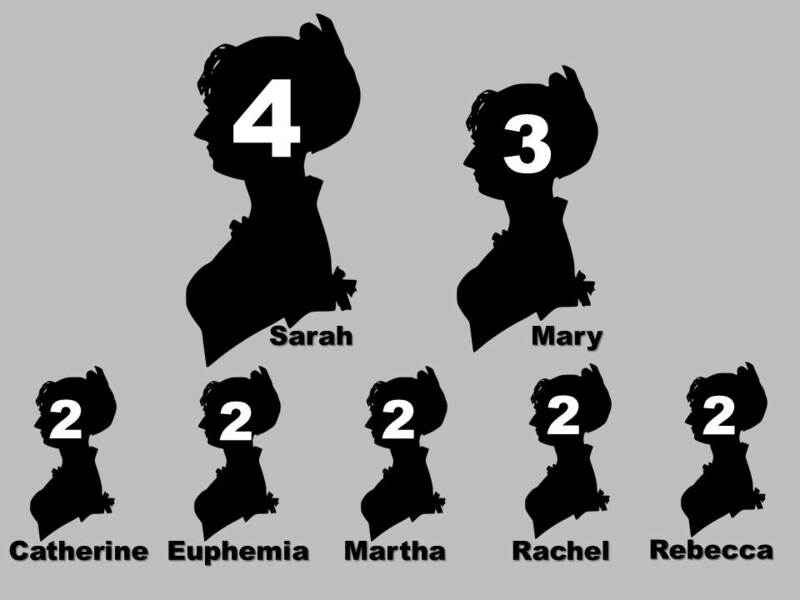 The most common names for Thomas Kirk's granddaughters were: Sarah (occurring 4 times), Mary (occurring three times), and Catherine, Euphemia, Martha, Rachel, and Rebecca each being used twice. Is it any surprise that Thomas and Sarah were among the most popular names for their grandchildren? 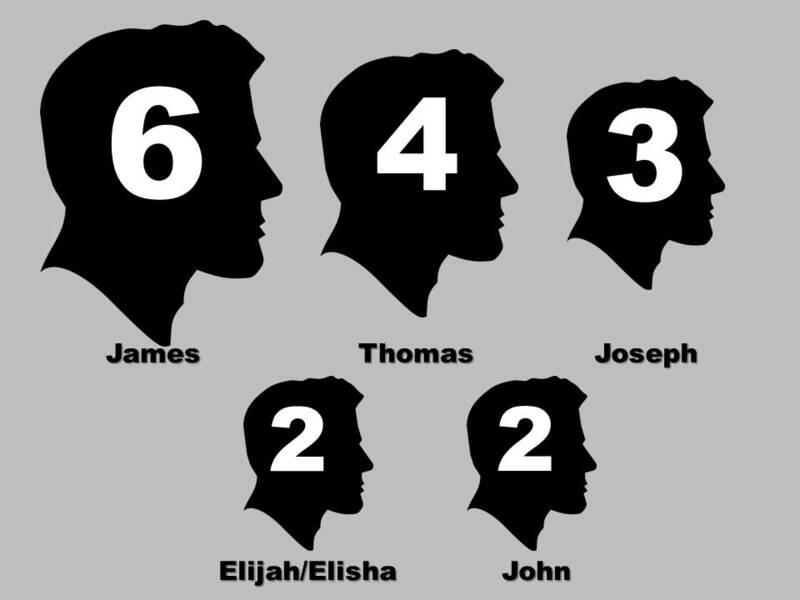 It's interesting that James was the most popular male name. I found no instances of Thomas' grandchildren named Vachel. Now, when we examine the Butler County Vachel Kirk's six children (Helen, John, Mary, Nancy, Thomas, and Vachel), only three lived to adulthood and had children of their own. The most common names for Vachel Kirk's grandsons' were Franklin, John, Joseph, and William. Each was used twice. Thomas Kirk's most frequently used grandson name, James, did not make an appearance among Vachel's grandsons. However, John and Joseph did overlap. Vachel Kirk's most common granddaughters' names were Emma (twice) and Mary (three times). 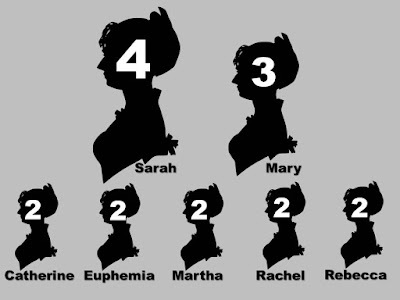 The only overlap between the two men's granddaughters was the name Mary - the most common woman's name ever! This exhausting chain of research gives me a foundation from which to begin exploring Fayette County, Pennsylvania for new clues. Certainly, any Kirks named John, Joseph or Mary will gain closer scrutiny. Any genealogists with 18th century Pennsylvania research tips or recommendations? I'm all ears (after this quick power nap). Have you tried this map? Researching is difficult because of the county changes, the old records reside in which ever county it was at the time.. I have been researching in south central PA. It was Cumberland, Bedford, Huntingdon and now Blair. A lot of the local Historical Societies have genealogical information. I hadn't seen this particular map, Claudia. It's a fantastic resource and helps put these changes in perspective with great visuals, too. Thank you for sharing! Fantastic graphics, Michael. Interesting use of exhausting instead of exhaustive. I'm rooting for you to get this figured out. Exhaustive research is exhausting work! :) But I'm having fun along the way, including burnishing my graphic design skills. I'm glad for the cheerleading - I'll take any motivating morale support I can get. This is fascinating research that you have done---I love how you followed the naming patterns. 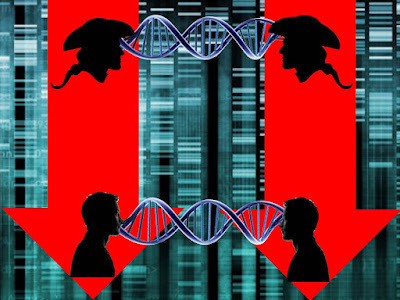 I hope that the autosomal DNA provides you with more clues. Keep is posted! Optimistically looking ahead and assuming one day that I do identify Thomas Kirk's father, I will be mighty curious to come back to the naming patterns and see whether the family abided by that custom. It's amazing what DNA can help genealogists do. I'll be sure to keep everyone posted on that initiative. Thank you, Dara. I enjoyed the process of creating them - a nice creative experience and different way to present the content.